Before performing any installation steps, review the proper cable routing and connections. The following topics contain detailed cable routing information. Position the hard drive cage in the chassis, over the chassis standoffs. Connect the hard drive data cables (panel 1). Press the plug into its socket until the plug snaps into place. 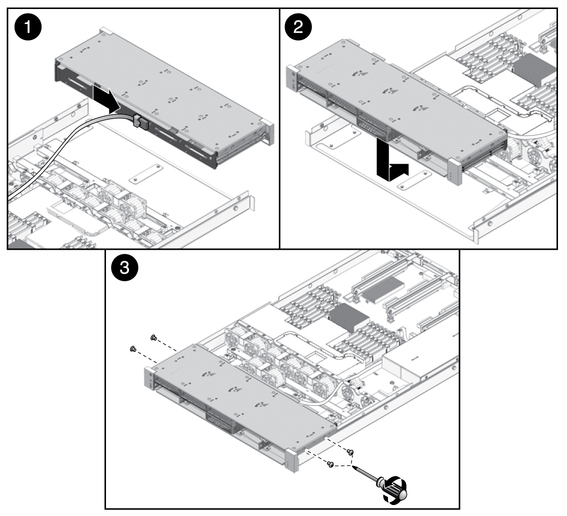 Note - If the cables do not reach the hard drive cage, perform this step after Step 4. (Sun SPARC Enterprise T5120 server, 8 disk-capable) Remove fan FM1. Slide the hard drive cage back until the hard drive backplane engages with the paddle card connector. Caution - Use care when installing the hard drive cage in the chassis. Align the hard drive cage with the base of the chassis before sliding the cage back. This care is needed to avoid damaging components. Replace the No. 2 Phillips screws securing the hard drive cage to the chassis. Two screws secure the disk cage to each side of the chassis. (Sun SPARC Enterprise T5220 server) Install the fan power boards. (Sun SPARC Enterprise T5220 and Sun SPARC Enterprise T5120 8-disk capable servers) Install the fan modules. (Sun SPARC Enterprise T5120) Install the inner glides. Slide each inner glide onto the mounting studs on the server until the glide snaps into place. (Sun SPARC Enterprise T5120) Install the server into the rack. See Reinstall the Server in the Rack. Note - Take care to be certain you are installing the hard drives in the correct drive bays. See Install a Hard Drive . See Install the DVD/USB Module. Note - As soon as the power cords are connected, standby power is applied. Depending on how the firmware is configured, the system might boot at this time. See Power On the Server Using the poweron Command.